This is yet another round in the on-going convenience-privacy boxing match. Amazon is positioning Alexa to track consumers’ prescriptions and relay personal health information to insert the technology into everyday health care. Amazon and health-care providers will collect data to improve voice recognition and track how consumers use the services.Voice technology has been slow to take hold in health care because of patient-privacy concerns. Consumers have been measured in their willingness to use Alexa for all but basic tasks. (And) Alexa has stumbled on privacy. Amazon is positioning Alexa, its artificial-intelligence assistant, to track consumers’ prescriptions and relay personal health information, in a bid to insert the technology into everyday health care. Seattle-based Amazon says Alexa can now transfer sensitive, personal health information using software that meets health-privacy requirements under federal law. 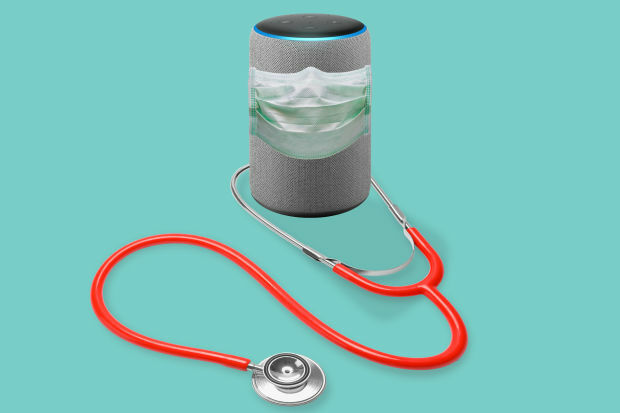 Five companies, including insurer Cigna Corp. , diabetes-management company Livongo Health Inc. and major hospital systems, said they developed new Alexa features for consumers using the federal protocol. The features let Alexa perform tasks such as scheduling urgent-care appointments, tracking when drugs are shipped, checking health-insurance benefits or reading blood sugar results. For developers of digital health services, the move is an avenue to expand the use of voice commands. Smart speakers have proliferated rapidly since their 2014 introduction, with one in five adults reporting they owned at least one in a 2018 national survey by Edison Research and NPR. But voice technology has been slow to take hold in health care because of patient-privacy concerns. The Health Insurance Portability and Accountability Act, known as HIPAA, requires that health-care companies and their contractors, like Alexa, take steps to keep patient information confidential, ensure it can be accessed when needed and prevent tampering. HIPAA violations can expose health-care companies to penalties and criminal charges. Consumers have been measured in their willingness to use Alexa for all but basic tasks, raising questions about whether the new features will be used widely. Alexa, too, has stumbled publicly on privacy. Last year, it recorded and shared a private conversation after miscues. With the new health-care features, Amazon will be able to further expand Alexa’s offerings as it battles technology giants with competing voice assistants, including Alphabet Inc.’s Google Assistant and Apple Inc.’s Siri. Amazon’s smart-speaker market share fell to about 40% last year from 59% the previous year, according to technology-focused venture-capital firm Loup Ventures. A spokeswoman for Google said the company’s developers aren’t allowed to create features that transmit information protected under federal privacy law. Apple declined to comment. Health-care executives said they see promise in voice commands as an easier alternative in some circumstances to typing or tapping a screen. “We were waiting for this level of privacy and security to be complete because it’s obviously critical,” said Richard Roth, head of strategic innovation for Chicago-based CommonSpirit Health, one of the nation’s largest hospital systems. The system, which operates 142 hospitals across 21 states, is developing its own Alexa option for appointment scheduling, he said. It wasn’t among those unveiled last week. Still, while health-care companies might be ready to connect with consumers via voice, consumers might not be.New York hospital system Northwell Health launched a service on Alexa roughly two years ago that searches for wait times at local emergency rooms and doesn’t require HIPAA compliance. It isn’t used widely, said Emily Kagan, Northwell’s vice president of digital and innovation strategy. “It’s been tepid,” she said of demand. Alexa made headlines last year after mistakenly recording a private conversation and sending it to someone else on a user’s contact list. The device picked up sounds it believed to be commands, but weren’t. Developers of Alexa’s new health features include Livongo, Cigna and its pharmacy-benefit manager Express Scripts, Providence St. Joseph Health and Boston Children’s Hospital. Each requires users to verify their identity to initiate the feature, according to Alexa product web pages and some of the companies. Atrium Health’s Alexa urgent-care scheduling feature does not. Livongo worked to avoid possible confusion that might occur when diabetic customers ask Alexa for blood-sugar readings, said the company’s chief product officer, Amar Kendale. Users must state both words—“blood” and “sugar”—for a response, to prevent any potential mixup caused by using the word “sugar” alone. Parents of heart-surgery patients treated by Boston Children’s Hospital can use the hospital’s new Alexa feature to report whether their children are experiencing pain or diminished appetite after surgery. The new feature will also offer appointment reminders. “Voice is natural,” said John Brownstein, the hospital’s chief innovation officer. Users don’t need to download apps or review tutorials to use speakers, he said. Amazon and health-care providers will also collect some data to improve voice recognition and track how consumers use the services. Developers of new Alexa services said such data would be valuable as they push to expand the use of voice in health care. Data will be stripped of identifying information before being shared and studied, some of the companies said. The Alexa feature offered by Providence St. Joseph allows consumers to book and cancel appointments at most of its express clinics in Washington state. The hospital system based in Renton, Wash., developed its feature by asking users to test it and studying their reactions to Alexa’s replies, said Aaron Martin, the company’s executive vice president and chief digital officer. User data will help further refine the technology, he said. “We’re training it and it’s training us,” Mr. Martin said.